Peleliu is a horrible place. The heat is stifling and rain falls intermittently--the muggy rain that brings no relief, only greater misery. The coral rocks soak up the heat during the day and it is only slightly cooler at night. Marines are in the finest possible physical condition, but they wilted on Peleliu. By the fourth day there were as many casualties from heat prostration as from wounds. On the second day, the temperature reached 105° in the shade--and there was very little shade in most places where the fighting was going on, and no breeze at all anywhere. It lingered around that level as the days dragged by (temperatures as high as 115° were noted). Water supply presented a serious problem from the outset. This had been anticipated (see Chapter II), and in actual fact the solution proved less difficult than expected; the engineers soon discovered that productive wells could be drilled almost anywhere on the comparatively low ground, and personnel semi-permanently stationed near the beach found that even shallow holes dug in the sand would yield an only mildly repulsive liquid which could be purified for drinking with halizone tablets. But it continued necessary to supply the assault troops by means of the scoured-out oil drums and 5-gallon field cans previously mentioned. This presented a problem even in the case of troops operating on comparatively level and open ground. Once the fighting entered the ridges, terrain difficult merely to traverse without having to fight, the debility rate shot upward so alarmingly that an emergency call was sent to all the ships offshore to requisition every available salt tablet for issue to the 1st Marines. The statement that heat prostrations equalled wound casualties is apt to be misleading.2 Most of those evacuated were returned to duty after a day or two of rest and rehabilitation; hence, did not permanently impair the combat efficiency of their units. But such cases did occur in sufficient profusion as to add a severe strain on the already overburdened Medical Corps elements. BUNKER, OR PILLBOX, of the type that infested Peleliu's low ground. After assault troops had overrun such positions, Japanese often sought to reoccupy these by infiltration. CAMP RISES amid ruins at base of Umurbrogal. Administration Building, center, served as 1st Division CP, within easy rifle range of Japanese still in the ridges. for Medical personnel organic to the regiments and battalions, who were themselves becoming casualties at an alarming rate; also the Shore Party Casualty Evacuation Sections which continued to handle evacuation and emergency treatment on the beaches under sustained heavy shell fire. As the limited capacities of the transports became filled, the problem became increasingly acute. 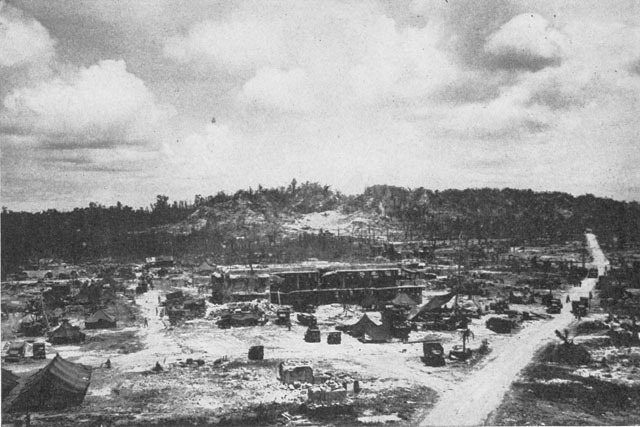 Another element which contributed to making Peleliu a "horrible place" was the insect life, combating of which also came under the auspices of medical personnel. GETTING THE WOUNDED OUT of the high ground was difficult, dangerous and painful. were dotted liberally across the island's surface, areas far too extensive and too tangled to make effective control possible. applied to nets, jungle hammocks and, when such became available, both exteriors and interiors of tents and other personnel shelters. The methods devised for handling it were varied. Perhaps the most novel, and ingenious, was the equipping of three 15-man sanitary squads with knapsack sprayers. These squads landed on D-Day, each attached to one combat team, and followed close in the wake of the assault units, spraying dead bodies, scattered food, straddle trenches, latrines and pools. A large power sprayer was mounted on a truck for more wholesale operations, and a special device was improvised which would enable planes to spread DDT in clouds across the whole area. Owing to combat conditions, however, the two last named appliances were unable to operate until D-plus 12. That this work was successful on the most essential score is witnessed by the somewhat broad statement, quoted above, regarding insect-borne disease. But the technique had yet to be perfected in all details; for it was found that, while DDT was deadly to adult flies, it was almost wholly ineffective on their larvae. Consequently, during the earlier stages the flies bred more rapidly than they could be destroyed, reaching peak numbers about the second week in October. By then, the strenuous methods employed by truck, plane and ground crews began to bear fruit, and a gradual decline set in. The problem, obviously, was still far short of complete solution, but a far-reaching advance had been achieved. During the early phases of the operation, the basic tactical unit on Peleliu was the regimental combat team. Thus, the story of most of the auxiliary elements is the story of the particular infantry regiment with which each was designated to operate.7 Subsequent alterations in the tactical situation led to some plain and fancy improvisation on the part of many elements, but this could not be foreseen during the first two weeks. The Artillery Group, commanded by Colonel William H. Harrison, comprised the 11th Marines, the 1st Marine Division's organic regiment, plus two battalions of III Amphibious Corps artillery: the 3d 155mm Howitzer Battalion, and the 8th 155mm Gun Battalion. The original operation plan assigned the 1st Battalion, 11th Marines (75mm pack howitzers) to support of the 1st Marines,8 and the 2d Battalion (also 75's) to the 5th Marines, with the 3d and 4th Battalions (105mm howitzers), together with the Corps Artillery, in general support. Development of the situation soon caused assignment of 3/11 to support of the 7th Marines. Although all battalions reverted to regimental command shortly after landing, the three mentioned continued to operate primarily in immediate support of their designated combat teams throughout the crucial phases of the campaign. There was no room ashore for the Corps Artillery during the first day and night, but the 3d 155mm Howitzer Battalion began landing on D-plus 1 and had all batteries in position and firing the following day. This unit's initial assignment was a dual one: deep support missions to the north, and what often amounted to point-blank fire (starting at ranges of 200 yards) against enemy installations to the southward in support of the 7th Marines. With completion of that regiment's mission in this area (on D-plus 3), all batteries were faced northward and continued to supply fires in that direction as long as it was practicable to do so. The 8th 155mm Gun Battalion landed on D-plus 2 and went into position near the 3d Battalion on the newly secured southern zone of Peleliu. This unit's initial mission was an unusual one: support of the assault on Angaur by the 81st Infantry Division (see Chapter VI). Its fire was not called for in this connection, however, and the battalion reverted to 1st Marine Division control on D-plus 4. In turn, it faced about to the northward and assumed its part in support of operations on Peleliu. During the entire first two weeks, artillery was employed in the conventional manner prescribed by "The Book," and with such businesslike efficiency as to make its work appear unspectacular.10 Preparatory, harassing and interdicting fires were furnished as the occasion demanded. Three aerial observers were maintained on station during daylight hours, and each battalion had its own forward observers with the combat team it had been assigned to support. These called down special fire missions on designated targets as desired, and since all the artillery on the island remained under 11th Marines control following the initial landing, there was little difficulty in supplementing such missions with additional fire from the elements in general support. Perhaps the best example of this flexible system at work was provided on the morning of 28 September (D-plus 13) when all battalions, with the exception of 1/11, concentrated intensive fires on Ngesebus (see Chapter VI) in preparation for the shore-to-shore assault on that island, and continued throughout the day to furnish what amounted to a rolling barrage to the front after the infantry had landed. 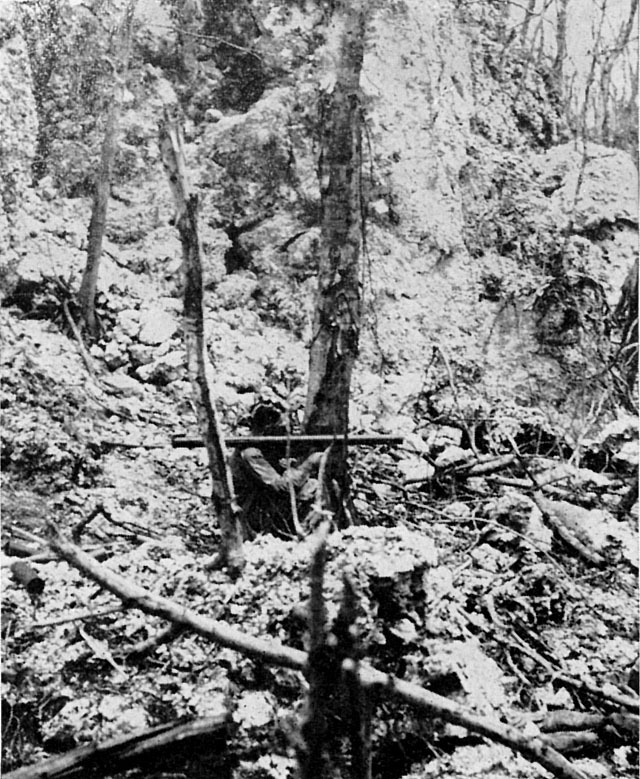 However, with the capture of Ngesebus and the securing of all of northern Peleliu on the following day, Japanese resistance was constricted within a pocket too small to permit further employment of massed fires without danger to friendly troops, and the function of the artillery in any conventional sense came to an abrupt end. The two 75mm pack howitzer battalions (1/11 and 2/11) were ordered evacuated11 with the first echelon of the division to leave Peleliu. A few of the 105's and 155's of the battalions remaining were adapted to some unique direct fire missions improvised for special occasions, and personnel not thus employed, reverting to the Marine's basic function as infantryman, manned a 1,000 yard sector of the containing lines west of the enemy pocket for more than two weeks until relieved by elements of the 81st Infantry Division on 16 October. "INFANTRYMAN'S ARTILLERY," the bazooka was the heaviest weapon portable to much of the high ground. Every opening and crevice might harbor stubborn Japanese. to battalion control on D-plus 1, in general they continued to operate in close-up support of their designated units for the duration of their stay on Peleliu. However, a greater flexibility was displayed in the employment of the tanks than was the case with perhaps any other reinforcing arm. This was necessitated by the fact that there were too few tanks to begin with, and during the early stages when the terrain was excellently adapted to tank operations, their services were at a premium. Furthermore, heavy enemy fire and the liberal distribution of mine fields called for some heroic maintenance measures to keep even those there in action.12 Units and parts of units were constantly shifted from one regiment or battalion to another in order to concentrate maximum tank strength where it was most urgently needed. In no operation anywhere did tanks and infantry work in closer mutual support, more as a team. This happy cooperation had its genesis as far back as when the division was training in Australia following the Guadalcanal campaign, and tank elements began working on a semi-permanent basis with the assault units they would support in combat, each becoming acquainted with the other's personnel and problems. This policy had paid dividends at Cape Gloucester and reached full fruition at Peleliu--and again, later, at Okinawa. At the end of 16 days of heavy fighting, both men and machines of the 1st Tank Battalion were badly depleted and debilitated. Furthermore, the fighting had become localized in regions which did not appear practicable for armored operations on any extensive scale (see Chapter VII). For these reasons, the battalion was relieved as a unit by the 710th Tank Battalion, U.S. Army,16 and departed the Peleliu scene with the first echelon on 1 October, a move which some believed at the time, and many more subsequently, to be premature. PRIVATE FIRST CLASS JOHN D. NEW, Medal of Honor winner, unhesitatingly flung himself upon an enemy grenade to save the lives of two forward observers. continued to be used for specialized missions, but the rest of the personnel reverted to the Marine's basic function of combat infantryman. Like the de-gunned artillerymen, they were used to man the containing lines during the closing phases of the operation. So were most of the personnel from the Armored Amphibian Tractor Battalion. On land the LVT(A) was too vulnerable to substitute satisfactorily for the Sherman tank, though a number of them did pinch-hit in this capacity in emergencies. After their excellent performance during the first assault phase, they were employed mainly for reef patrol to the northward against Japanese counter-landings and for special direct fire missions against targets which could be reached only from offshore. The number and importance of these missions, too, gradually decreased. Company A and H&S Company (less Heavy Equipment Section) to 1st Marines, Company B to 5th Marines, and Company C to 7th Marines. These units did not revert to parent control until D-plus 10, and even after that were held in close contact with the combat teams to be available for special missions on call. 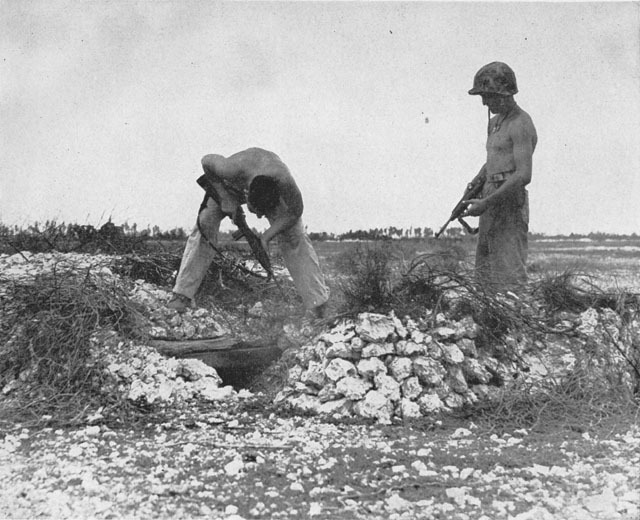 Road building, airfield repair and maintenance, beach development, water supply, etc., were handled by the Engineer Group, consisting of Heavy Equipment Section of H&S Company, 1st Engineer Battalion, and the 33d and 73d Naval Construction Battalions.20 All of these operations were carried through promptly and efficiently. Enemy shelling and delay in getting heavy equipment ashore slowed somewhat the repair of the airfield, but the target date was met. On the other hand, water supply proved a less serious problem than anticipated, and because of the short duration of the operation building construction was never more than a minor factor. Existing roads built by the Japanese proved capable of handling the increased load temporarily following the landing, so priority was given to the construction of new roads to the additional unloading points so urgently needed. 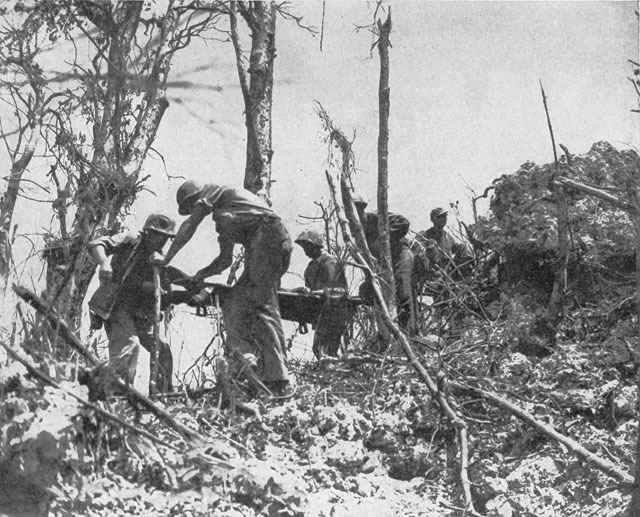 The first such artery ran to SCARLET Beach, following the securing of southern Peleliu. Then engineers worked closely behind the 5th Marines on that regiment's drive to PURPLE Beach on the eastern shore. The natural advantages existing at this spot were developed by the construction of LST landing ramps and pontoon causeways, and with completion of the vehiclular highway, PURPLE Beach became the most important unloading point on the island. Other construction projects included an airfield perimeter road and the improvement and maintenance of trails to facilitate supply of advancing infantry units. A main road along the west coast, in southward extension of the existing West Road, was begun but, owing to higher priorities elsewhere, had not been completed at the time engineering functions passed to the Island Command. control upon establishment of the Division Shore Party Commander ashore, though still in support of the regiment they had accompanied. Some 500 replacements for the division had been turned over to the shore party, and these were organized, for administrative purposes, into Companies D and E of the 1st Pioneer Battalion. These companies were relinquished to division commencing about D-plus 3, and the entire Pioneer Battalion was relieved on D-plus 10 by garrison unloading elements which had been functioning from the beginning as part of the Division Shore Party. Upon being relieved, most of the battalion's heavy equipment was shipped back to the division's base camp in the Russell Islands. So was Company A, which had seen rigorous service in support of the battered 1st Marines and had been reattached to that unit upon its evacuation (see Chapter VI). Companies B and C were ordered up to front line defensive positions in the western ridge zone on 27 and 28 September, where they relieved units of the 7th Marines for further offensive operations. Here they remained in occupancy throughout the remainder of Marine participation in the Peleliu campaign until relieved by elements of the 321st Infantry on 17 October22 (see Chapter VII). Furthermore, the Japanese potential for effective counteraction on a major scale had been destroyed with the elimination of an estimated two-thirds of effective enemy strength. This achievement had cost a total of 3,946 Marine casualties:24 the virtual elimination of one infantry regiment, as such, and the serious depletion of two others. In that all of Peleliu that possessed any strategic value had been secured, the commanding general's early prediction of quick conquest had not fallen so far short of literal realization. Organized resistance, clearly, was far from at an end. But even at this stage, no one not gifted with clairvoyance would have predicted that two more months were destined to elapse before it would be. 2. The literal truth of this statement is impossible of proof, as no adequate records are available. Many prostration cases were never evacuated beyond the bivouac areas of their own units, hence were not recorded at all. 3. As mentioned in Chap II, diversion of many LVT's to this humane work had much to do with the delay of later waves in getting across the reef. 4. Company A ("A-Med") was the first Medical Battalion unit to set up, as such, near the WHITE Beaches. Even after they were all established, the hospitals in the more forward positions were repeatedly harassed by infiltrating Japanese, and on several occasions special defensive and mopping-up details had to be provided for their protection. 1st Mar Div SAR, II, Anex D, 4. 5. Ibid, 3. This report adds: "All unit commanders praised their efficiency, zeal and cheerfulness in performing their duties. They are considered ideal for this type of duty." During later phases of the operation when non-assault troops were used to contain the enemy (see Chap VI), many of these men served in the lines as volunteers. 6. Ibid, 4. This literal quotation has been widely challenged on the basis of the frequent incidence of dysentery, references to which occur in several unit reports. 7. The term "regimental combat team" (RCT) was official in the Marine Corps as well as the Army, but the common practice of referring to them by regimental designation still persisted at this period. For detail of task organization, see Appendix H.
8. Owing to the tactical situation ashore on D-Day, 1/11 actually landed attached to the 7th Marines. This did not affect its basic mission, however: from the outset it acted in support of the 1st Marines and subsequently (see Chap VI) the 321st Infantry. 9. Because of heavy enemy fire and their inability to find suitable operating positions, the two remaining batteries of the 3d Bn were ordered to reembark on LST's for the night. Three of the DUKW's had been so seriously damaged during this double reef crossing that they sank upon reaching deep water, taking the guns and other gear with them. What remained of the two batteries came in again the following day, but another of the 105's was knocked out by enemy fire that evening. The eight guns remaining performed their mission satisfactorily from that point on. Wood, MCS Monograph. 10. "The 11th Marines were employed in supporting the attack in accordance with the accepted doctrines and principles for the employment of field artillery; it was well handled and rendered timely and effective support throughout the normal attack phase of the operation." Wood, op.cit. 11. By what proved great good fortune, a heavy storm prevented loading of these units' howitzers, several of which subsequently performed valuable service in a new role. See Chap VII. 12. Forty major tank casualties were sustained by the battalion, of which only nine proved total losses. Of the 30 tanks landed, never were there less than 18 operational at one time, and the average was 20. 1st MarDiv SAR, Annex J, 10. 13. The personnel to man these tanks were brought along, however, and proved valuable as replacements, battalion casualties running high during the opening phases of the operation. Ibid, 12. 14. Ibid, 7, 8. See also Chapter VI, this monograph. 16. Company A, 710th Tank Battalion, arrived on Peleliu with RCT 321 (see Chap. VI) and was attached operationally to the 1st Tank Battalion. Following relief of the latter unit, Col Stuart and several of his staff remained on the island to assist and advise the 710th, whose previous training in tank-infantry tactics was considered rather sketchy. 17. This causeway ran seaward from the lower end of ORANGE 3, and was in full operation by 21 Sept. 1st MarDiv SAR, II, 6. 18. Although the 1st Motor Transport Bn brought in the trucks of only one company, many other units were permitted to land some of their organic vehicles. All these were supposed to be pooled under control of 1st MT Bn, but owing to the diverse interests involved, such control was difficult to exercise and the system proved less than satisfactory. De Bell. 19. "Infantry demolitionists were not employed as such, and engineer troops were called on for all (sic) major and minor demolition tasks." 1st MarDiv SAR, Annex I, 4. 20. Approximately 550 men from the attached naval construction battalions ("Seabees") operated with the Shore Party during the first ten days on the beaches, after which time responsibility for unloading passed to garrison elements. 21. 1st MarDiv SAR, II, Annex C, 3. One favorable factor was the short haul once ashore to effect distribution: "Amtracks and DUKW's could move directly from the water to the Regimental dumps in most cases." Ltr Col John Kaluf to CMC, 7Mar50, hereinafter cited as Kaluf. 22. 1st MarDiv SAR, Annex C, 5. 24. 1st MarDiv SAR, II, 7.